Connect you STM32 Nucleo-64 to Ubidots and launch your asset tracking and monitoring solutions. 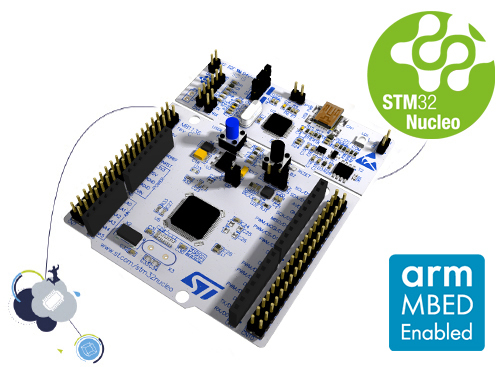 The STM32 Nucleo-64 is an affordable and flexible board that combines various different combinations of performance, power consumption, and features to optimize your connected applications. The Arduino™ Uno V3 connectivity support and the ST morpho headers allow you to easily expand the functionality of the STM32 Nucleo's open development platform to deploy devices for cargo tracking and monitoring or simple home automation projects like water flow meters or electric monitoring. The STM32 family offers an extraordinary menu of options, including ARM Cortex-M cores, giving us the flexibility to find the perfect STM32 for our applications. And the various MCU series of the STM32 family allow for various high performance, mainstream and ultra low power options. In the following guide we will introduce the NucleoL476RG of the STM32L4 MCU series which offers an excellent option for ABC SOLUTIONs. 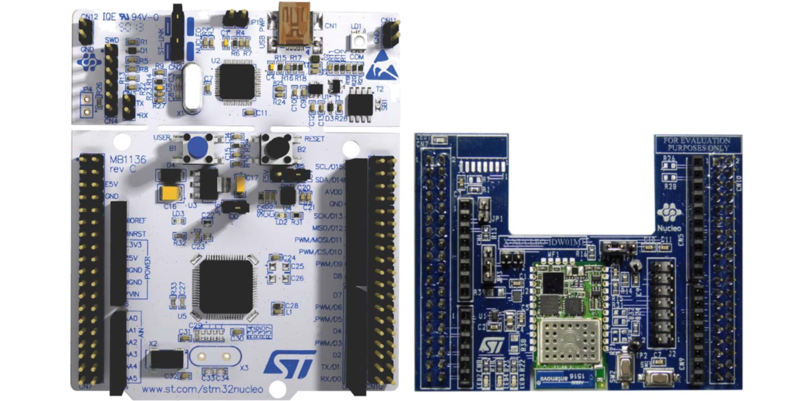 For additional information into the STM32L4 MCU series, reference the ST product materials. To program the microcontroller simply access the free MBed OS online compiler; to access your account or sign up click here. IMPORTANT NOTE: Some X-Nucleo-IDW01M1 shields require a little additional modification to fully connect the hardware. Check if your device has an R21 resistor? if so, you may have to remove the R21 resistor to fully connect the shield with the board. 2. Go to the the Mbed OS developer site, press Hardware > Components. Then, in the communication menu press Wi-Fi to filter the search and select the X-Nucleo-IDW01M1. 3. Then "Import program" of the Hello World example. 4. To verify, check if the Nucleo-L476RG board is available in the up right-hand pane of the compiler. 5. Next, verify that the libraries "NetworkSocketAPI" and "X_NUCLEO_IDW01M1v2" are imported into the project. along with this program. If not, see <http://www.gnu.org/licenses/>. Send sensors value to Ubidots. This example sends 3 variables to Ubidots. which interfere with STLink/SWD programmer. Please unmount R21 to fix it. The compilation will generate a BIN file, download and save it for later. 9. Now, connect the Nucleo mini USB to your computer. 10. Then upload the BIN file into the board. The board will appear as an USB drive icon, so just drag-and-drop the BIN file previously downloaded into the USB drive assigned to the board; for additional details, reference this guide. Status variable is a boolean and shows the status of the user blue button on the Nucleo Board- a 0 in Ubidots means the blue light will be off and when the button is pressed, the light will illuminate and a 1 variables will be sent to Ubidots for visualization. 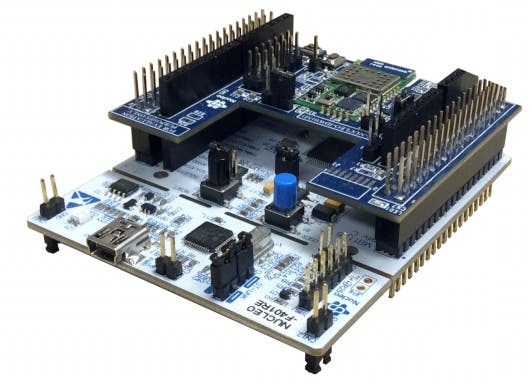 The STM32 Nucleo-64 board is a versatile option for nearly any IoT application. With the ability to connect different shields and purchase different memory and pinout specifications, this hardware can solve most, if not all, of your required IoT deployments. From tracking cargo conditions as they ship across the country or monitoring water flow speed for the local hospital, the STM32 Nucleo-64 can do it. Using this simple tutorial you can now connect your STM32 Nucleo-64 to Ubidots and deploy your applications with ease. If you need additional resources in setting up your device or deploying your applications, reference Ubidots Help Center with any doubts.